Damaged window screens can sometimes be repaired; screens with major damage probably will need to be replaced. If a fiberglass or metal screen has a small tear, repair it easily with clear silicone adhesive. Just dab it over the tear and let the glue set. Several coats may need to be applied to completely seal the hole. Metal screening can also be "darned" with strands of scrap screening. Unravel a strand or two and, using a sewing needle, weave the strands into the undamaged screen. For larger holes, consider applying a patch. To make a repair of this type in metal screening, first square off the hole's edges using a utility knife. Then cut a piece of scrap screening about 2 inches larger than the damaged area. Unravel a couple of strands on each side of the patch and bend them at a 90-degree angle. Fit the patch over the opening, inserting the strands through the screening. When the patch is adequately positioned, bend the wires over to secure it. A similar technique can be used to mend fiberglass screening. Again, square off the damaged area, cut an oversized patch from scrap material, and affix it with clear silicone glue. 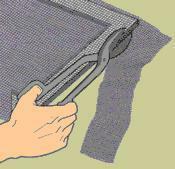 To replace a metal-framed screen, begin by laying the screen on a flat surface. Metal-framed screens are held in place by a vinyl spline that fits into a channel around the frame's perimeter. To remove the spline, insert the tip of a flat-bladed screwdriver into the channel and pry it up. Once started, the spline pulls easily out of its channel. 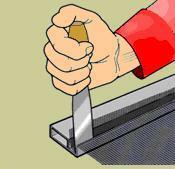 There are several methods for installing screening in wood frames, but the following method is common and easy to do. The screening is held in place by staples that are driven all along the perimeter of the sash. A heavy-duty stapler and 1/4-inch staples are best for this job. Do not use a household stapler. Remove the wood molding concealing the staples. Gently pry up each strip, using a putty knife. 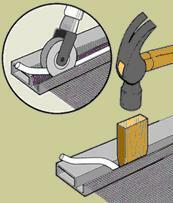 Be very careful--older moldings can be quite brittle. Next, remove the staples holding the screening to the frame, and then discard the old screening.